We have all seen it in the news. Families devastated by the incredible power of nature, picking up the pieces of their lives from the rubble. The price for the rich area surrounded by the beautiful nature we live in is the threat of massive earthquakes. The plate tectonics that helped build our mountain ranges also created an environment venerable to seismic activity. 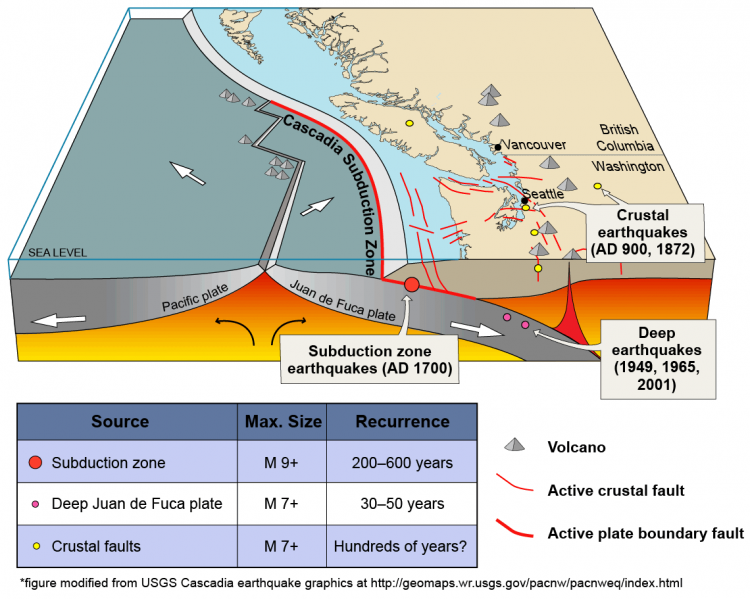 Within the next 600 years, it is almost certain that a major tectonic event will occur in the subduction zone between the North American and San Juan de Fuca plates (as seen above). Megathrusts in this region have the potential to create magnitude 9.0 earthquakes that would destroy bridges and infrastructure essential to our way of life. Although this may seem like a distant threat with a long timeline, even relatively minor activity has the potential to interrupt your life. The Nisqually earthquake in 2001 cost the City of Seattle over $20 million in damages to buildings and infrastructure [Earthquake Keypoints]. Despite these threats, most people in the Puget Sound do not have earthquake insurance. Contrary to popular opinion, your regular homeowner’s policy will not cover you in the event of an earthquake. The rates for standard homeowner policies are determined by statistical data that does not include catastrophic events such as earthquakes within their equations. The good news is that many homes qualify for optional earthquake coverage that can be purchased to cover your dwelling and/or personal property. Depending on your house and area, rates may be more affordable than you think. After all, it is better to be prepared than to put your family and yourself at risk hoping the threat will pass. Contact Issaquah Insurance Agency to find out what policy is right for you.